On this day 70 years ago, our nation changed forever. On December 7, 1941, the United States was attacked at Pearl Harbor. Shortly thereafter, we officially entered World War II. Twelve ships were sunk, nine were damaged and more than 2,400 Americans lost their lives that day. The attack on Pearl Harbor is not only remembered by navy veterans and military personnel but also by anyone who realizes the event shaped our nation’s history. Those who lived through the attack were haunted by the tragic events and lost many of their friends and even loved ones. At 7:55 a.m. Hawaii time today, about 120 survivors, military leaders, Navy Secretary Ray Mabus, along with 3,000 other people, will join at a memorial site that overlooks the sunken USS Arizona in Hawaii. There will be a moment of silence. The Hawaii National Guard is expected to fly F-22 jets ending the moment of silence. The keynote address will be provided by Mal Middlesworth, a USS San Francisco Marine veteran who was present during the attack. Today’s events join other activities going on this week that also honor veterans of the historic attack. Five ash-scattering ceremonies are planned for survivors’ remains that are coming back to Pearl Harbor for the first time. National news stories across the country are honoring veterans and their families by profiling survivors and sharing their impactful yet devastating recounts from the events of 70 years ago. Beyond the horrific memories of the attack, survivors are also burdened by health complications that still persist from diseases such as mesothelioma. 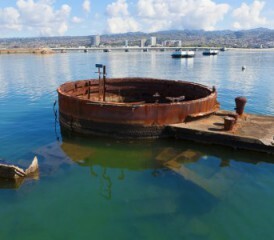 Military veterans, especially Navy veterans like those who were stationed at Pearl Harbor, are at an increased risk of contracting deadly diseases and cancers because of asbestos exposure. Mesothelioma is a rare cancer of the lining of the lung that develops after prolonged exposure to the toxic substance known as asbestos. Many Navy veterans have already displayed cases of the cancer. Frank Curre is one of these veterans who likely developed his mesothelioma from his service in the Navy. A month prior to the 70th anniversary, Curre recounted his memories of that fateful day with National Public Radio. Curre was cooking on the USS Tennessee the day of the attack. That day changed him forever. His experiences continue to haunt him, just as his health does. Because of the effects of the cancer, his case of mesothelioma is not always apparent to the eye. The disease is often accompanied by chest pains, dry coughing, harsh breathing sounds and shortness of breath. Eventually, it leads to death. Navy veterans who have mesothelioma likely were exposed to asbestos on Navy ships where the deadly mineral was frequently used. When undisturbed and contained within products, the substance is not dangerous. However, when the fibers are disturbed and enter the air, they can be ingested and get stuck in the human body where they gradually destroy your organs. Currently, no cure exists for mesothelioma. However, patients who get diagnosed early enough may have a chance at curative treatments. The cancer claims between 2,000 and 3,000 lives every year. Office of the Press Secretary. (2011, December 7). Statement by President Barak Obama on the 70th anniversary of the attack on Pearl Harbor.